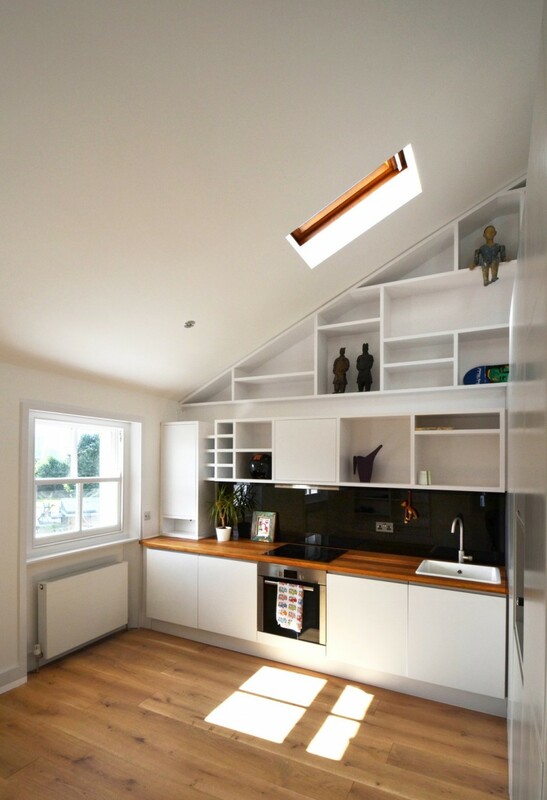 Loft spaces in London – particularly in densely-populated Camden – are notoriously small. This Camden loft used to be an office space, but when it was to be converted into a flat, Craft Design Studio came up with some innovative ways to make this small space feel like a spacious, stylish home. Storage has been fit into every possible space in the apartment. 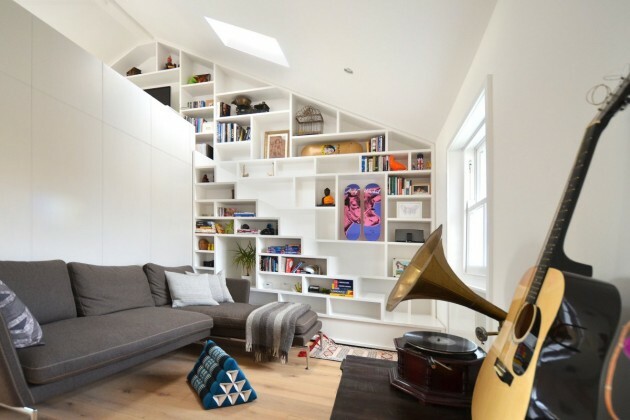 Along every wall you’ll find shelves, cubbyholes and niches to hold the owner’s collection of books, art and objects. Built into the staircase along the back wall is a narrow staircase that leads upstairs to the mezzanine-level sleeping area. The sleeping and working area resides atop a central loft volume which looks like a big white box and sits in the middle of the living area. It houses the bathroom facilities and even more storage. 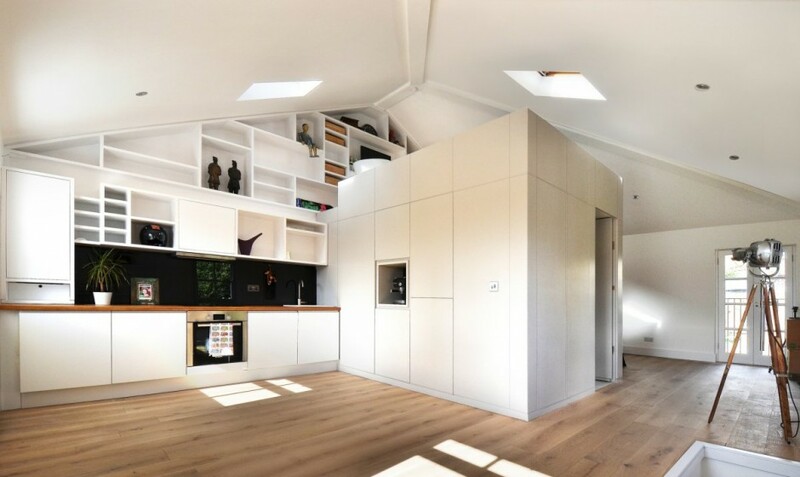 This central volume, illuminated with natural light from several skylights, allows the loft to feel larger thanks to the space between it and the ceiling. “The idea was to maximise the sense of space as well as keeping a simple and efficient layout,” say designers Hugo D’Enjoy and Armando Elias. The rest of the loft on either side of the central “box” contain every other amenity needed for living comfortably. A sitting area occupies one side while a kitchen/dining room inhabit the other. 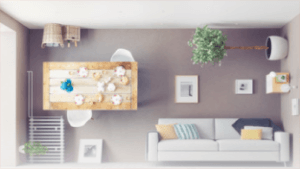 The simple, clean color palette lets the owner’s personality shine through and increases the visual space of the otherwise-small living quarters. The result is impressively compact and cozy. You can’t even tell it used to be an office, unlike many other workspace-to-home conversions. 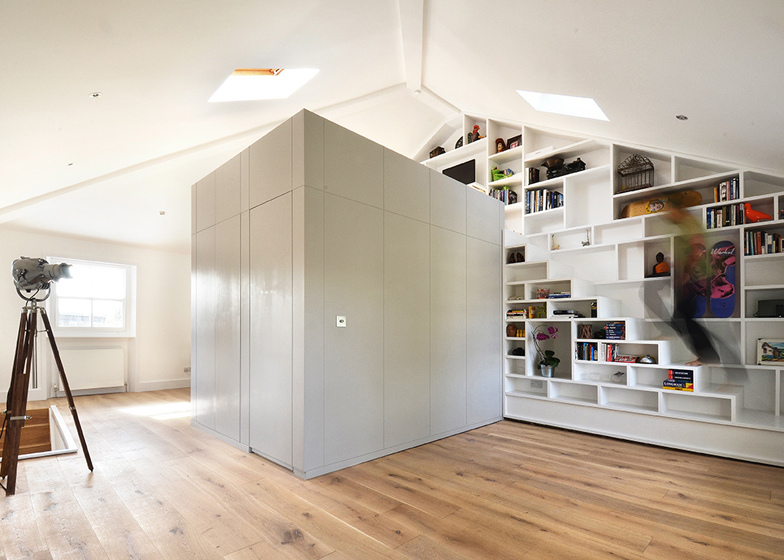 Loft cubes are especially cool when you can access the top, and in this case, the openness of the design makes the tiny space feel much airier than it might have with a different layout. This London loft remodel is a winner.